I love symbols and symbology - connectedness is what I seek in nearly everything I pursue. I like to think it all, WE all, have meaning and that whatever we project, employ, wear, and ornament ourselves with has meaning, and value. So, today, on St. Patrick's Day, a day we traditionally drink green beer (green and beer don't work visually with me, ack! ), wear green to celebrate the day and the coming of Spring (bring on Summer!) and toast, "May the Luck of' the Irish be wit ye!" (historically the Irish were not a lucky lot)... I will attach my own meaning and symbology to this day. 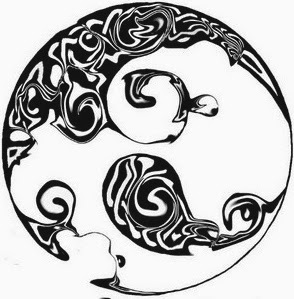 I use a stylized yin yang in my logo to represent harmony and balance. I seek it, I think about it, I try to achieve it, but I am horribly imbalanced. I overdo. I put all my attention on one or two things and push everything else to the edge of my mind where no light shines on it. One of the last admonitions my mother ever made to me was, "You need to be balanced. Please." My mother is gone from life now; today represents the 15th anniversary of the day I last saw her physical form, touched her hand, promised her I'd do all she had asked, and tucked a longish note to her under her hand, for the journey. Silly. I know. But symbolic, to me, and the last gift I could physically give her. I'll give you a small hint how to 'find meaning'. You must CREATE meaning. That's what I'm doing here. Here on this blog. Here in this workshop. Here in this life, I truly believe - my purpose is to forge - with my two hands - meaning. It's why I design "things", even though my ever-practical Irish grandmother protested all my life by saying, "There ain't no money in it." There ain't no money in it. Maybe so. Maybe not. But, there is value. All I know is I must create. More than that: I will. In Life, Love and especially in Art, I crave connection. My entire purpose in design is creating an 'Aha!' experience, connecting you with the piece and with yourself, amplifying and emphasizing who you know yourself to be.